12:53pm- Sitting waiting patiently for the presentation to start. Hoping that Mr Shortz is planning on hitting us with some puzzles. I've been practicing very hard with the Puzzler on Weekend Edition, so if you hear a squealy, know-it-all voice yelling out answers, it's probably me. Also if the answers are completely wrong, it's probably me too. 1:03pm- Listening to the Will Shortz intro. 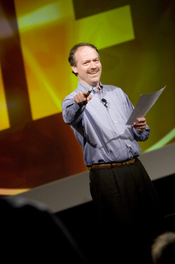 Will Shortz is apparently the only enigmatologist in the world (he self-designed his major at Indiana University, later did his law degree at Virginia). He sold his first puzzle at the age of 14! That's awesome! 1:05pm- Wondering how nerdy it would be to get a "NPR 4 LYFE" tattoo. 1:06pm- Mr Shortz just said he's going to do a audience puzzle session! Sweet! 1:06pm- Mr Shortz's favorite puzzle of all time was published in 1996. 1:07pm- Joe Krozel (sp?) published another all time favorite of Mr Shortz, this year. 1:08pm- Two yearly holidays marked in the New York Times crossword each year; Christmas and April Fool's Day. 1:09pm- Mr Shortz favors puzzles that have a visual scheme as well as difficult clues. This makes my head hurt, and is the reason he's the enigmatologist. 1:12pm- Discussing the famous "marriage proposal" crossword. This is just a note to any potential suitors, not the best way to propose to me since I've never finished a NYT crossword. Ever. 1:14pm- ALL TIME FAVORITE CROSSWORD: Appeared Election Day 1996. Clue "Tomorrow's Election Results" could be filled in with either 'CLINTONELECTED' OR 'BOBDOLE ELECTED.' People who filled in Clinton thought Mr Shortz was being presumptive, people who filled in Dole felt he was way off. 1:16pm- Two letter words are not allowed in American crosswords. Most are prepositions, and there's no interesting way to clue "of". 1:17pm- Note to all puzzle creators: made-up words are not allowed. Mispellings can't be listed as "variant" in the clue. 1:18pm- Clue: Where moles may try to dig. Answer: CIA Headquarters. 1:20pm- The crossword is a 20th Century Invention, first one to appear in the US was in The New York World. Was called a "word cross" by Arthur Winn (sp?). Second week the puzzle asked, "Can you fill in the cross-words?" and by the third week the puzzle was titled Crossword, hence the etymology. 1:21pm- Simon & Schuster published the first crossword book in April 1924. Simon was like, "Yeah! Let's do it!" Schuster was like, "Mehhh..." [Ok, I stole that from the Daily Show] But in all seriousness, Simon & Schuster weren't entirely sure about publishing a puzzle book as the first book to launch their publishing house, so they took their names off of the cover. 1:22pm- At the end of the first year, they had sold 400,000 copies of their crossword book! 1:23pm- Apparently, the New York Times felt that crossword puzzles were beneath them. I wish he would have said gauche. But they gave in, and started running them daily in 1950. 1:25pm- No one at the Times knows what a crossword editor does. Mr Shortz says the majority of his job is correspondence, which he attributes to an increase in the quality of the puzzles. 1:25pm- The easiest puzzle is Monday, builds up in difficulty to Saturday. The Sunday puzzle is actually more of a Thursday level of quality. 1:26pm- Clues should be amusing and engaging, but also wrack your brain. 1:26pm- Mr Shortz types the puzzle on his Mac. Just another reason to come to the Mac side of the force. 1:27pm- "Sometimes people don't like the puzzles and the mistakes they think they find. Emphasis on think." 1:27pm- The error with the most mail ever: Appeared in the 90s- answer was Rupp Arena, got in trouble by stating the arena was in Louisville, not Lexington. Attributes this to a poorly verified Google search. 1:29pm- Audience Q&A- How far ahead do you work? Mr Shortz: Not as far as I should, but right now I'm working about a week ahead. 1:30pm- Bill Clinton is the most famous crossword solver-- on a good day he can do three to five puzzles a day. He also times himself as he solvles the puzzles. He also takes phone calls while solving. 1:32PM- Will Shortz is crazy about Soduku. Did I miss some announcement about Soduku and why I should like it? He's also working on bringing another Japanese game, CanCan, to the US for release in October. 1:33PM- Tips for solving NYT crosswords: Start with a Monday level difficulty, then move on as far as you can. Fill out what you know for sure, and look for unusual letters to help with the whole grid (J, X). Put the puzzle aside if you can't figure it out and come back later. 1:35PM- Palin had traditionally been used in a Monty Python sense, but the next time it comes around it most likely will be about a certain Alaskan Govenor. 1:36PM- Every Soduku puzzle will have a unique answer. And will make me feel like a dimwit. 1:37PM- www.phily.com/sodoku- National Soduku Challenge with a $10,000 grand prize. Takes place in October. Tell your [ridiculously clever] friends. 1:38PM- One last question, then some games. LET THE FAIL BEGIN! 1:40PM- Talking about crosswords in color. Starting to realize that there's a level of nerdy intellectual even I can't reach. 1:42pm- Government by thieves: kleptocracy. 1:42pm- New game invented by Mr Shortz called Meet The Champ. If only I weren't live blogging I could really embarrass myself. 1:44pm- Actually the scoring system is so complicated I would have to be THE CHAMP just so I wouldn't have to do the math. 1:44pm- Just divided the room into Cats and Cards (UK Cats and University of Louisville Cardnials for those of you outside of Kentucky). The crowd is not pleased at the arbitrary assignment of these team designations. 1:45pm- Larry from the Cards is winning. Mr Shortz notes that volunteers to challenge the champ don't need to give their names until they're actually champion, lessening potential embarrassment. 1:48pm- And Larry has been defeated by Shelia of the Cards. 1:48pm- Shelia is down. Defeated by Chris of the Cats. 1:49pm- Chris wins again. I can't tell you the score though because there's math with roots and squares involved. 1:51pm- "What comes between Ecclesiastes and Exodus alphabetically?" The answer he took was Esther, but Ephesians does too. Unless this is some Old Testament/ New Testament beef. 1:53pm- Stumped on a question, a champ asked if he could ask LeAnn. As in from Weekend Edition. 1:54pm- "What comes between flush and full house alphabetically?" I said free of a kind, but apparently that was not correct. 1:55pm- The Puzzle Master repeated a question! 1:56pm- Oh no, a new puzzle. But no new scoring system so I won't know if I win. But it is about puns, which I am constantly embarrassing myself with, so I've got a chance. 1:57pm- These puns are bad, even by my standards. 1:59pm- Carol just lost for the Cards. The Cats won, but I don't know what the score is, again, because of the math thing. 2:00pm- I yelled out a wrong answer, so at least I got that much right. I'm out. This just goes to show how nerdy I am. The new Japanese puzzle that Mr. Shortz is introducing this year isn't Can Can, it's Ken Ken. I am ashamed of myself for noticing. Thanks for the wonderful summary of the session. It was a lot of fun!